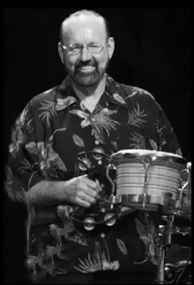 American drummer and percussionist, brother to Paul English, a long time drummer for country singer and musician Willie Nelson until today, he assisted his brother for the past thirty years. Earlier collaborations are dated about 1975 as stated in Willie Nelson - Red Headed Stranger as he previously stayed with the church and played in evangelist Kenneth Copeland’s band until he permanently joined Willie’s band in 1984. For the american jazz drummer please use Bill English.